Kindness is the gift that you and the child you read this to will receive. Through sweet, simple prose and vivid illustrations, this heartwarming book encourages positive behaviour as children see how very easy and rewarding it is to express kindness, appreciation and love on a daily basis. The book is also the winner of seven awards . 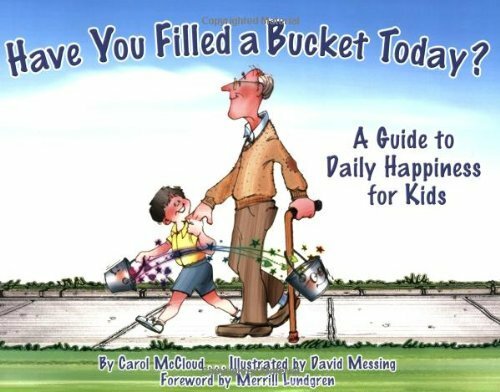 Carol McCloud is an early childhood specialist, popular speaker, and president of Bucket Fillers, Inc., an educational organization in Brighton, Michigan. She and her team of Bucket Filler educators have traveled across the United States giving school assemblies and staff development seminars. I absolutely love this book. I am always trying to teach my kids how to be kind to others, how to love, how to respect ... this book is just great! It explains in a simple way how we can be good to one another, and offers a powerful visualization in the form of a bucket. 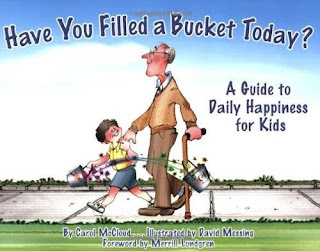 My daughter will sometimes say, out of the blue "I love you", and then tell me she's filling my bucket. I would recommend to anyone, child or adult, to buy this book. I will probably keep reading this book to my kids ... into their teens if they'll let me! Buy it - you won't be disappointed!